In the life cycle of risk for and disease leading from health to end stage organ failure (see figure below), therapeutic or other interventions can modify a patient’s outcome if offered early enough. 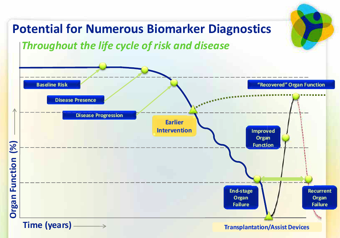 Biomarkers can help determine where patients are in the life cycle of risk and disease, so that appropriate interventions can be provided. Alternately, biomarkers help to prevent unnecessary treatment, by identifying or predicting which patients are unlikely respond to a particular therapeutic. Help us to better understand the life cycle of risk and disease. Predict or diagnose organ failure, so that disease can be detected before illness is evident and allow for intervention at an earlier stage. Assess patient risk and predict possible events and outcomes. Anticipate desired or adverse effects of therapy. Monitor disease progression and the effects of therapy. Act as surrogate and/or companion markers to help create and test different therapeutic strategies including pharmacological, environmental and behavioural interventions.